I am no politician, and I doubt I’ll ever intend on attempting to understand politicians because I believe many of them don’t have the sense that God gave a goat. One thing that I do know a little about is the automotive industry and what is put on blast in the media, on TV, and through the internet. In the current state of America’s economy it is obvious that it still stinks BUT, we are actually showing growth in areas of the American automotive industry. When President Obama took office we were already headed for disaster, and many of us are still unsure if President Obama actually helped our economy with the government’s hands in the American auto industry. Two of the big three took a bailout that we are all too familiar with, while Ford was able to rebuild without billions of our tax payers money. 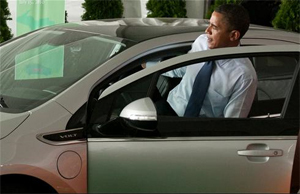 Some of the most recent stories in the media will tell you that things are on an upswing as President Obama visits the heart of car country at a Chrysler plant, Chevy’s Volt plant and Ford’s plant where they will be building the new 2011 Ford Explorer. Given the depth of the automotive industry and the slowdown of consumer spending, the automotive industry is only showing marginal returns. Nevertheless, they (GM, Ford and Chrysler) are turning over a profit, something that they have not seen in 6 years, says Obama. Critics are still taking issue to President Obama’s plan that poured billions into American car companies in an effort to “save” them from disaster. If we face the facts of the matter, we would have seen a trickle down effect of automotive suppliers pulling the plug if one of the big three were to actually liquidate or close their doors completely. Whether that meant an even bigger job loss than what we have already seen or a possibility of someone else absorbing that failed company. We will never know what would have taken place. What we do know is, some people are claiming to see a victory on the horizon. Some analysts and industry experts believe the American auto industry dodged the bullet but are still on the battle field. Others might tell you the bullet wound is still bleeding out and needs another doctor to fix it. From an economic standpoint, a large percentage of Americans feel that they have taken ownership of two American car companies. Basically, tax payers have footed the bill on this bailout and they want to see better results. Could it be some have less patience than others, or is the growth that we are seeing in the American auto industry a direct result of “the bailout”? These are my questions to you: Was the automotive bailout necessary? Ford did just fine without the assistance. Were GM and Chrysler so bad off that they needed this type of “bailout” assistance? Would we have seen a bigger crisis in America if they didn’t have an automotive bailout? Would we be seeing the marginal growth in the American auto industry TODAY? Was the “Investment” in the future of this industry worth it? 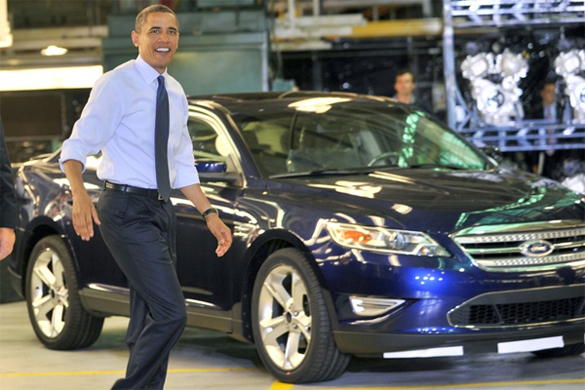 Check out the videos of President Obama’s visit to the Ford, Chevy, and Chrysler plants below.